Every Hobbit/ Lord of the Rings fan will know there are two countries you need to visit- England and New Zealand. England, to see where Tolkien lived, worked and was inspired; New Zealand because the country was transformed into Middle Earth for the Lord of the Rings/ Hobbit films. A lot of filming was done near Queenstown, but if you’re visiting the North Island, here are five Hobbit locations in New Zealand you need to stop and visit. At the time we were visiting, both airports had Weta Workshop’s craftsmanship on show. 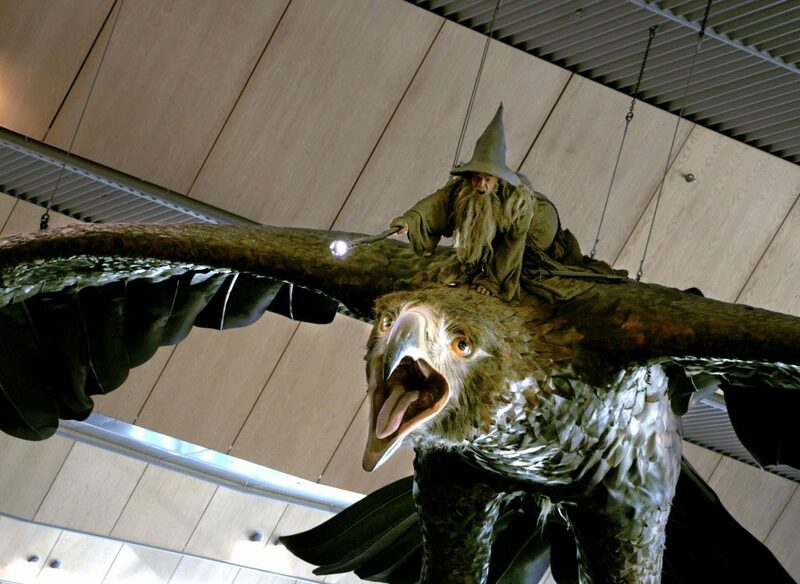 Flying into Wellington Airport, and you’ll be greeted with the sight of Gandolf soaring on giant eagles in the Domestic terminal (on Level 1 after you exit from Gates 3-17, near Billie Chu). There are only a handful of places to see the work from the studio who created the Hobbit/Lord of the Rings films, so it’s worth taking the time to appreciate the realism of the props. I must’ve been so focused on the eagles that I missed Gollum (unless he was removed?). If he was still there, he’s fittingly, grabbing for sweet juicy fishes in the middle dining area. If you’re flying out of Wellington airport, you’ll find Smaug where Air New Zealand check-in is located. 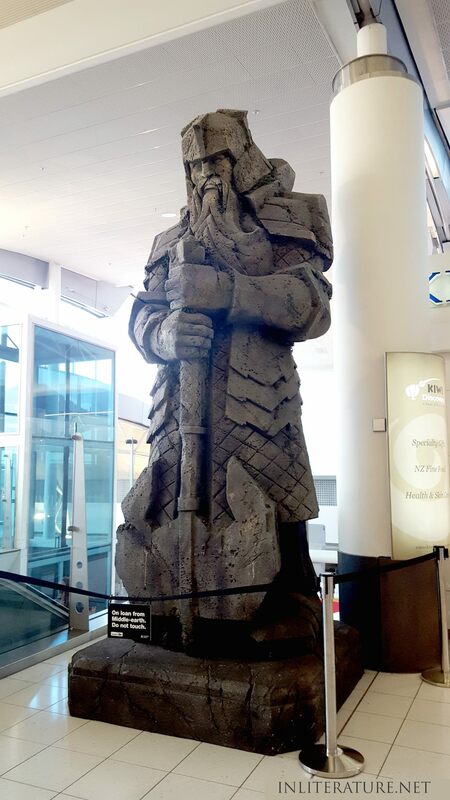 Meanwhile, if you’re at Auckland International Airport flying home, you’ll come face to face with a 16ft dwarf sculpture on the upper floor next to the elevator. If you’ve flown into Wellington, keep trekking through the heart of New Zealand’s film industry. 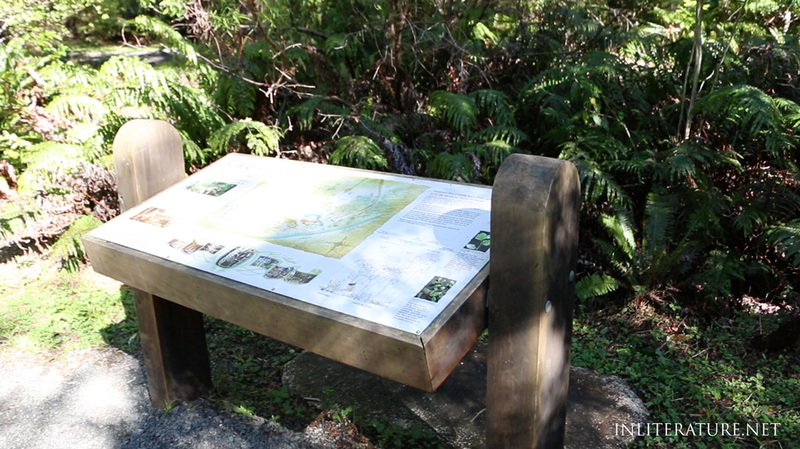 The second stop is a free location: Mount Victoria. If you have time to hunt around for specific locations, you can apparently find a handful of scene locations including Frodo’s Tree where he hangs out smoking a pipe, ‘Race to the Ferry’, ‘Shortcut to the Mushrooms’ and the ‘Black Rider on Top of the Hill’. Thanks to, I assume, the City Council, they’ve made it much easier for us to follow a path marked ‘Hobbit’s hideaway’. It’s here where the Hobbit’s hid from the Nazguls in The Fellowship of the Ring. Personally, we started at Majoribanks St, having stayed at a little motel down the road, and walked up the road till we reached the stairs. A signpost points the way, so turn right at the bottom of the stairs, and head up past the green dog park area on the left. 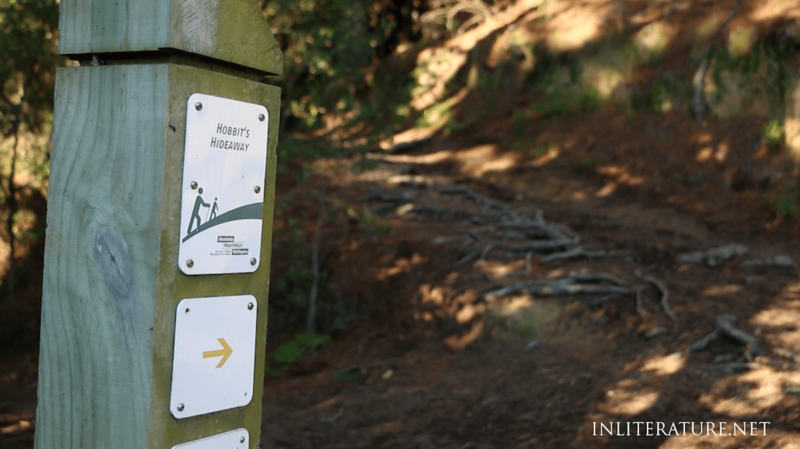 Then put on your walking legs and hike up until you reach a post that points to the left–you’re at the Hobbit’s Hideaway path. Apparently, the tree the hobbits hide under in the scene, was actually created by Weta Workshop instead of a real tree. But walking along that path brings you a step closer to Middle Earth. I’d say it’s about 1.5km return from Majoribanks St, however, there are other ways to get there, with numerous walking trails around. Use this map of Mount Victoria from Greater Wellington Regional Council to print off and find your way. The first part is the Weta Cave. If you’re strapped for time, grab a photo with the trolls out the front, then poke your head in the cave. 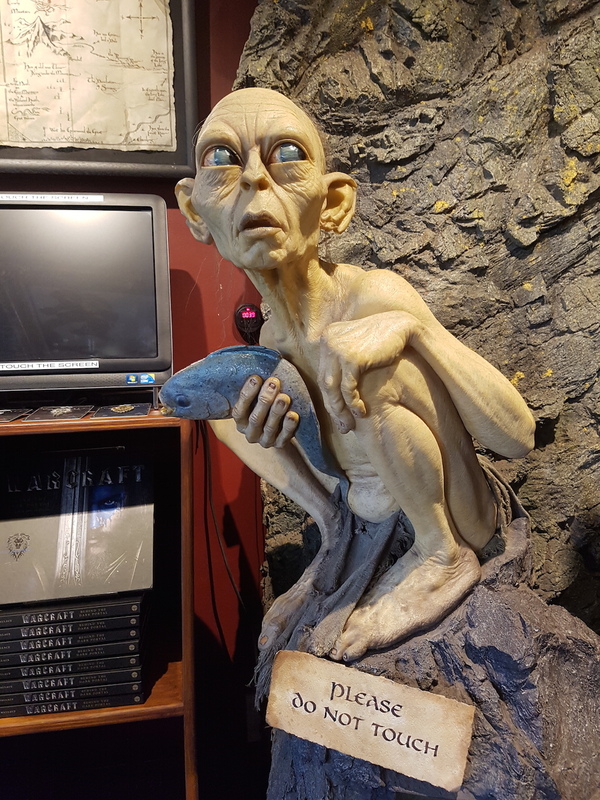 The cave is a retail shop where you can buy trinkets and prop replicas, you can grab photos with Gollum or Lurtz, watch a documentary or step into the mini (one-room) museum. 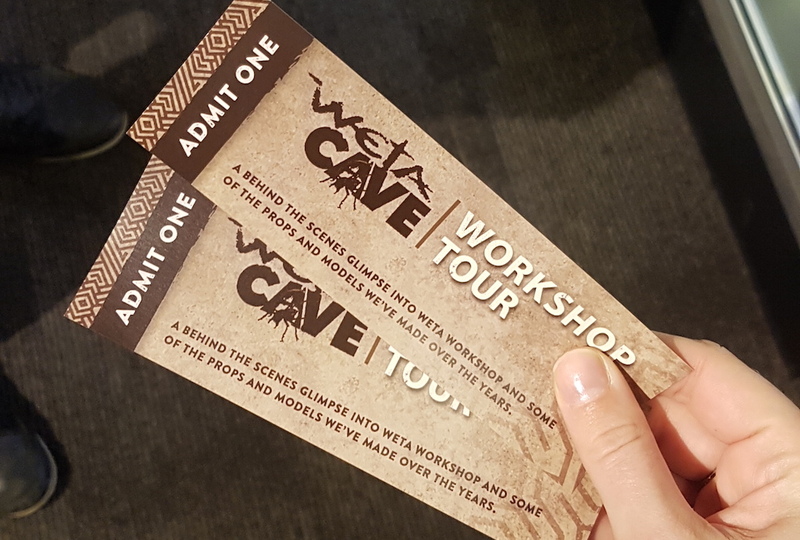 The second part is the Weta Cave Workshop Tour. A staff member (not just a hired tour guide), takes you through the prop making process, lets you hold props and talks about the work done previously and, if they’re allowed to mention, what they’re working on now or what is about to be released. It’s rather a sneak peek rather than access to their workshop. If you’re travelling with someone who didn’t watch the Hobbit or Lord of the Rings trilogies, it’s still `an interesting tour for everyone. I did the tour with someone not too familiar with the trilogies, and they really enjoyed it. At the time of writing, the tour was $25NZD. 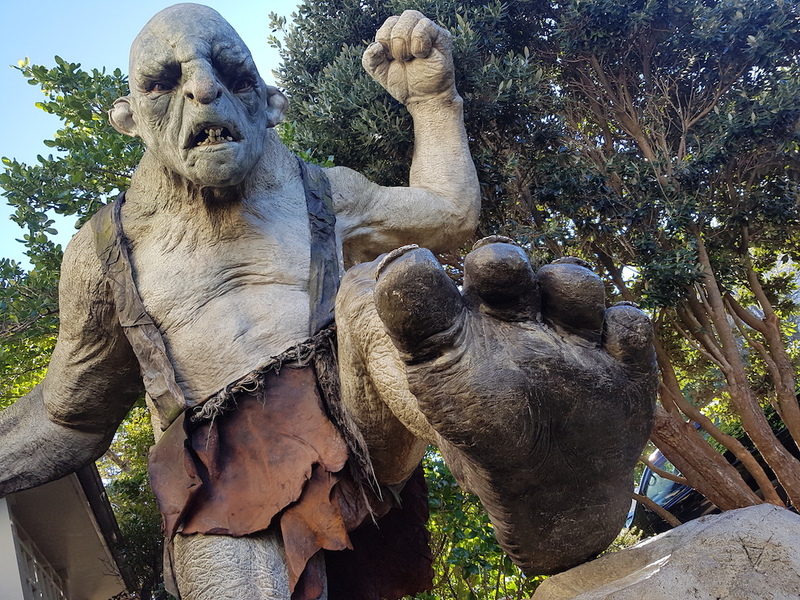 Visit the Weta Workshop website to find more tour information. It’s time to hit the road to Upper Hutt, a 45 min to 1 hour drive north of Wellington, to Kaitoke Regional Park, home of Rivendell. 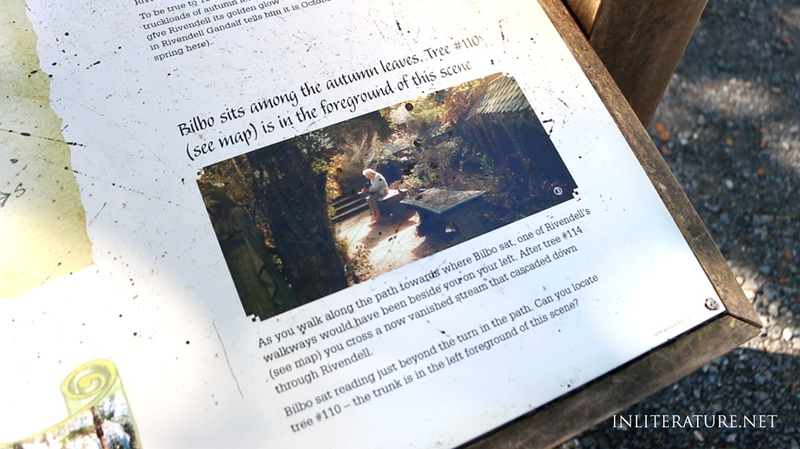 There’s no missing the spot– not only does the road signage mention Rivendell, you can type Rivendell or Rivendell car park into Google Maps, and it’ll guide you exactly there. 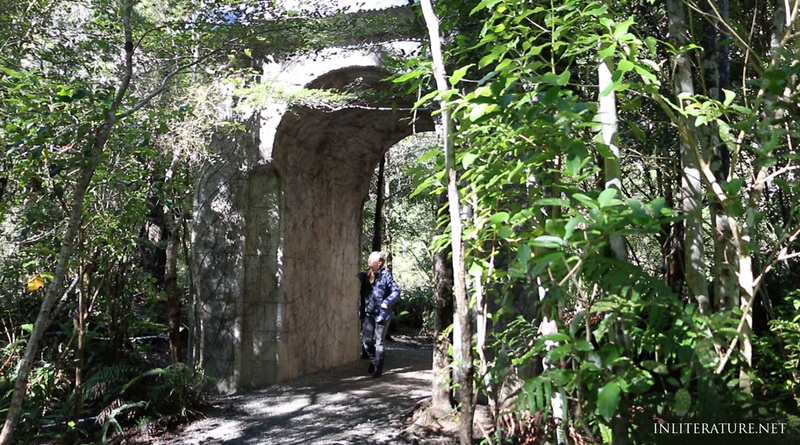 Greater Regional Wellington Council with Wellington Movie Tours also had an elven inspired arch (similar in style and half the size of the original) constructed as a little reminder of the movie magic that was created here. Visit the Greater Wellington Regional Council website for more information on Rivendell, or visit their Hutt River Trail page for more Lord of the Rings filming locations nearby. 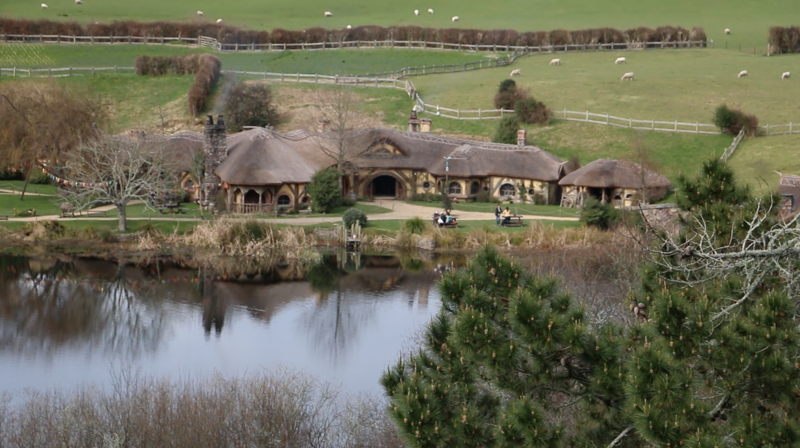 The final stop: Hobbiton. 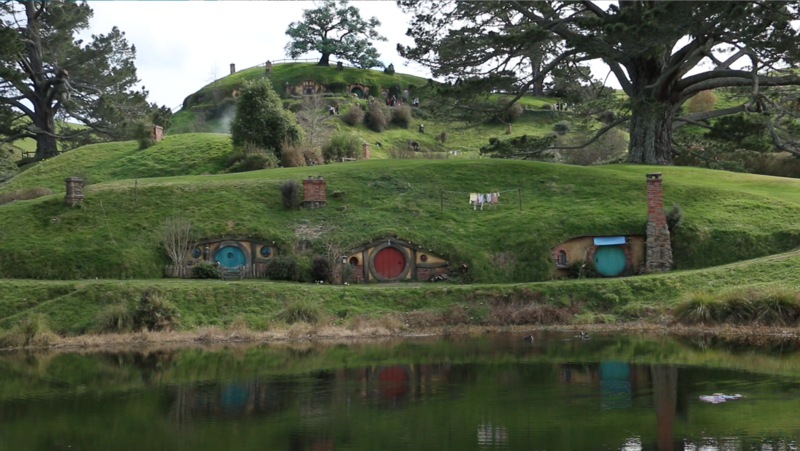 A 2 hour drive south of Auckland, stepping into Hobbiton is going to make any Hobbit fan giddy with happiness. Even those not familiar with the trilogies will be pretty impressed. You feel like, here in this corner of New Zealand, if you just went up to a door and knocked, a hobbit would answer. Each building is designed to reflect the hobbit that lives there, everything from the baker to the beekeeper, even the town drunkard. 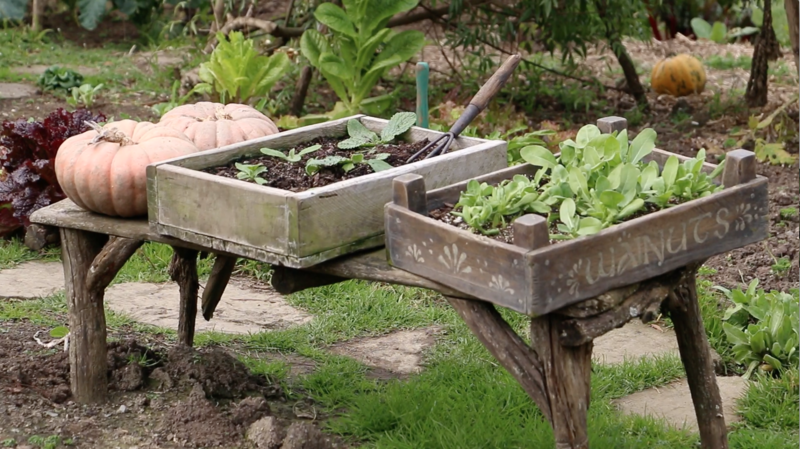 With full-time gardeners and a crate of seedlings to go into the ground, you feel like you’ve just missed a hobbit as they’ve ducked off for a second breakfast or lunch. This is a fully guided tour as the Hobbiton set is on private property (a working farm, as you can see by the sheep in the background in the next photo), so, unfortunately, you can’t go at your own pace. The tour takes ~2 hours though, plenty of time to see all the buildings and take numerous photos. 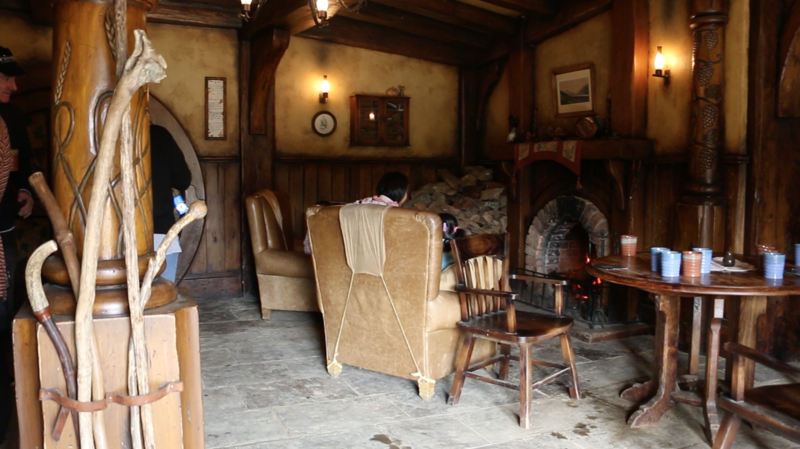 My favourite part, and the part that did feel a little rushed, is the Green Dragon Inn. 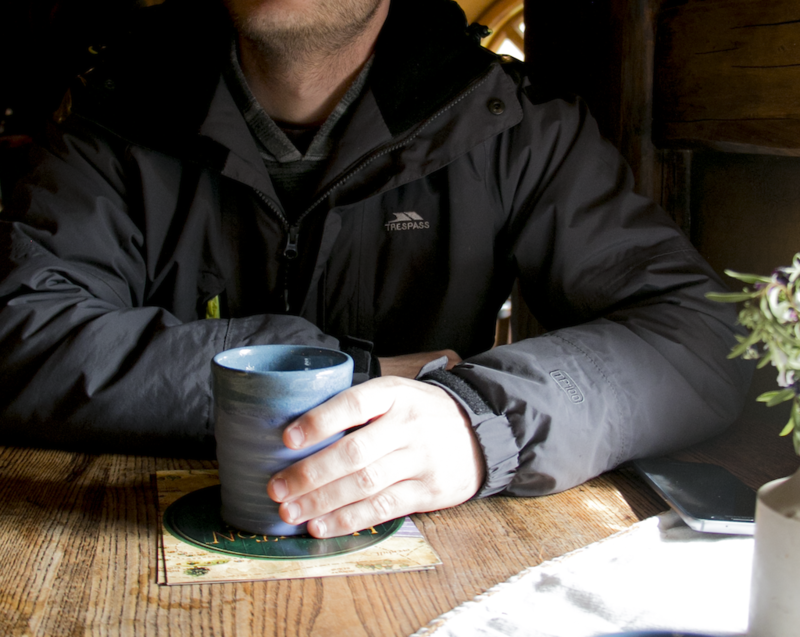 Part of your ticket includes a drink in this perfectly quaint Hobbit pub. There’s a non-alcoholic ginger beer, a cider and amber ale to choose from. If spending more time at the Green Dragon Inn is your idea of Hobbit heaven, they also have evening banquet tours, which yes, cost more money, but it means having a dinner in the Green Dragon Inn. At the moment, they run the banquet tours Wed & Sundays throughout the year but do run additional banquet tours on other days during summer (which being in New Zealand is Dec-Feb). 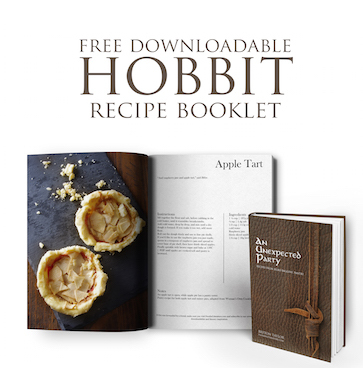 Visit the Hobbiton website to learn more.